At times, hearing your own inner voice can be extremely difficult amid all the static of the modern world. SpiritQuest Retreats is the one and only retreat business that offers a Personal and Group Retreat Center in Sedona, Arizona. We will give you both the space and the tools necessary to silence the clutter of the mind and connect with the quiet wisdom that’s always there in the heart, through guided Spiritual and Emotional Healing Retreat Sessions. Our purpose is to work on our own Divinity and help others work on theirs. We recognize and honor the human need to connect Self with Spirit. We also believe that when the Divine Essence is reached, regardless of the method or path, it can only be known as Love. For this reason our retreats in Sedona are non-denominational and non-sectarian. We’re open to all people, regardless of their religious affiliation or spiritual practice. Our only concern is that you leave our SpiritQuest Retreat Center transformed by your experience here. SpiritQuest offers private Sedona Retreats that can be customized to fit your mind, body and spirit. Our private retreats offered at our Retreat Center are truly intensive and the most powerfully transformative retreats offered in Sedona — or anywhere else for that matter — because they give you the opportunity to work one-on-one with a hand-picked team of master practitioners who are focused completely on your needs. This format provides the greatest return possible on your investment. Come to Sedona and experience a retreat at the best healing center in town. Our SpiritQuest Retreats consist of 3-4 sessions per day. Typically, we like to have you inside the peaceful Retreat Center for part of the day and out on the beautiful red rocks of Sedona for a segment of your day. We have a very specific way that we order our retreat sessions and can best design your customized package if you give us a call, however if you are interested in seeing the selection of what we provide, take some time to browse our offerings. The next step would be to call your retreat coordinator at 928-282-2509. She will help you put together a retreat that is uniquely yours and will benefit you the most. We Custom Build Your SpiritQuest Retreats. Whether you’re healing from emotional trauma, going through a major life transition, or simply ready to embrace yourself as the master of your own life, now is the perfect time to experience for yourself the amazing transformation that has changed so many lives! 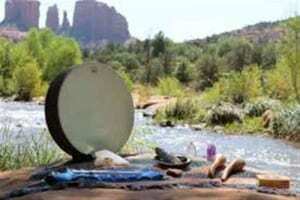 SpiritQuest Retreats offers holistic retreats in Sedona that can address all aspects of mind, body, and spirit. We offer private, customized retreats as well as group events. Your retreat is hosted at the retreat center and on the sacred red rocks of Sedona. You can spend a day with us or two weeks! Just let us know what you need and we will be there for you. What is the purpose of your visit to SpiritQuest? We take a holistic approach for Mind, Body, Soul health. We know Everyone is different. Our mission is to put the focus on you. Our philosophy is one of helping you find tools for repair. We cater to your specific needs. Our mission is to bring better communication. Do you feel a deep sense of self-worth? Let us help. We know that peace comes to those who seek. Reach out and heal. What Clients Say About Their SpiritQuest® Retreat Experience. Words can't express all the wonderful things I have experienced during the last seven days. Each session with SpiritQuest Sedona Retreats seemed in perfect order. I loved the fact that none of the practitioners had any other agenda other than me, that they didn't look at their clocks, that they had nothing to sell me other than sharing their knowledge. What a wonderful gift that was. None of them cared where I lived, what kind of car I drove, or how I looked. They looked at my soul, mind, and heart. That's really what it was all about. There isn’t one part of this experience I wish I hadn’t done. Everyone I’ve interacted with since arriving home has noticed a difference in me…..a good one! I tell people that when I showed up at SpiritQuest I felt like one body with a bunch of different people inside but I left feeling whole. This is the difference everyone notices in me. If you’re even thinking about doing this I would urge you to do it. Go into it with an open mind and soak it all in and you can’t help but get something good from it. The releasing ceremony was a great way to start. I could feel my mind opening to the whole process. The Shiro Dhara and massage was very relaxing and wonderful. Lorrie was knowledgeable and helpful. The guided meditation was a wonderful experience. And the session on the land was beyond words. It was such a moving experience with a person who was willing to give so much of herself to help me. SpiritQuest proved to be a vehicle to a wonderful experience of self discovery. The relationships that Katherine has established proved to be invaluable in creating my own itinerary to the experience that I truly hoped to witness when finding a retreat in Sedona. The attention to the unique needs and desires that I had, made my personalized experience so special and fulfilling. I never felt lumped into somebody else's program or itinerary. I got so much more out of this wonderful experience than I would have hoped. Keep up the wonderful work guys!!! One of the country’s premier comprehensive guides to Spirituality, Holistic Health and Sustainable Lifestyles. We did a week-long retreat with one of their writers who was going through a major transition in her life at the time. SpiritQuest is focused on affordable luxury destinations and experiences... that sweet spot where experience and price intersect to create WOW! The practitioners have a wealth of knowledge. The Shiro-Dhara in particular was amazing! I felt that the cognitive inventory of my personality was right on. This information helps me to continue to realize myself. Thank you SpiritQuest! We both remember our retreat with delight and laughter. I'd like to return immediately. I'd very much like to have a yoga retreat, as well as explore more healing modalities, and of course, I would want to share the experience with Mary Jane. We found this experience to be powerful and moving. Thank you SpiritQuest! This experience is exactly what I have been needing for the past couple of years. I am so thankful to SpiritQuest for providing such a miracle in so little time. You provided 'The Masters' to teach me how to find my purpose and keep my energy. I am now feeling 10 fold better because of this experience! I plan to further my understanding of all I have learned to bring myself to that heightened place that I desire. Scheduled Group Retreats, or Day Packages. Call SpiritQuest Today to Make Your Reservations.